Ann Case, a life-long resident of Missouri entered the financial services industry in 1981. Ann works with clients from all walks of life, helping to improve their lives by addressing financial goals and continuing to plan for tomorrow while focusing on personalized customer service. Fiercely independent, she founded her own firm and in doing so is able to provide her clients with the individualized attention and guidance that is too often lost with Wall Street Firms, banks and trust companies. Ann Case is a CERTIFIED FINANCIAL PLANNER™ Practitioner and holds securities registrations 7, 63, and 24 through LPL Financial, as well as a Missouri and Kansas Life and Health Insurance License and a Missouri Real Estate License. Additionally, she is a Registered Principal with LPL Financial. Ann currently serves on the Excelsior Springs Hospital Board of Directors, Excelsior Springs Hospital Foundation, Good Samaritan Board of Directors and is also a Board Member for the Watkins Mill Association. Ann was past President of the for the Excelsior Springs Museum and Archives Board, President of the Lawson Rotary Club, is a Paul Harris Fellow, was formerly Vice-President of the Excelsior Springs Optimist Club and Co-Art Chairperson with the Downtown Excelsior Partnership. Ann has been named four years, Five Star: Best in Client Satisfaction. This elite Five Star award* is bestowed on those wealth managers who have exemplified service, knowledge and communication. Ann Curty-Case is among the 7% of the wealth managers in the Kansas City area to be chosen by their clients and financial services industry professionals for this elite award. Ann currently serves on the Excelsior Springs Hospital Board of Directors, Excelsior Springs Hospital Foundation, Good Samaritan Board of Directorsand is also a Board Member for the Watkins Mill Association. Ann was past President,of the Excelsior Springs Museum and Archives Board, President of the Lawson Rotary Club, is a Paul Harris Fellow, was formally Vice-President of the Excelsior Springs Optimist Club and Co-Art Chairperson with the Downtown Excelsior Partnership. Ann has been named four years, Five Star: Best in Client Satisfaction. This elite Five Star award is bestowed on those wealth managers who have exemplified service, knowledge and communication. Ann Curty-Case is among just 7% of the wealth managers in the Kansas City area to be chosen by their clients and financial services industry professionals for this elite award as a Five Star: Best in Client Satisfaction. This elite Five Star award* is bestowed on those wealth managers who have exemplified service, knowledge, and communication. Ann received her Associates of Arts degree from York College, York, NE, her Bachelor of Arts in Political Science from the University of Missouri-Kansas City, and her MBA from Rockhurst University in Kansas City. In 1987 she received her Certified Financial Planner(CFP®) certification and in 2002, her Accredited Asset Management Specialist (AAMS) certification. 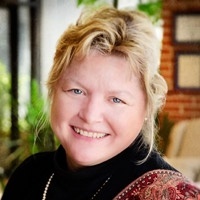 Ann received her Associates of Arts degree from York College, York, NE, her Bachelor of Arts in Political Science from the University of Missouri-Kansas City, and her MBA from Rockhurst College in Kansas City. In 1987 she received her Certified Financial Planner(CFP®) certification and in 2002, her Accredited Asset Management Specialist (AAMS) certification.